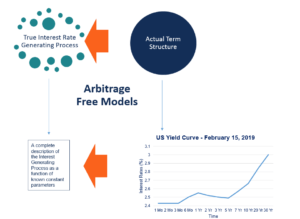 What are Arbitrage Free Term Structure Models? Arbitrage Free Term Structure Models (also known as No-Arbitrage Models) are used to generate the true stochastic interest rate generating process by using real market dataDow Jones Industrial Average (DJIA)The Dow Jones Industrial Average (DJIA), also commonly referred to as "the Dow Jones” or simply "the Dow", is one of the most popular and widely-recognized stock market indices. Unlike equilibrium term structure modelsEquilibrium Term Structure ModelsEquilibrium Term Structure Models (also known as Affine Term Structure Models) are stochastic interest rate models used to estimate the correct theoretical, which make certain assumptions about the true interest rateInterest RateAn interest rate refers to the amount charged by a lender to a borrower for any form of debt given, generally expressed as a percentage of the principal. The asset borrowed can be in the form of cash, large assets such as vehicle or building, or just consumer goods. generating process to determine the correct theoretical term structure, arbitrage free term structure models use the actual term structure (known as the realized term structure) to estimate the true interest rateInterest RateAn interest rate refers to the amount charged by a lender to a borrower for any form of debt given, generally expressed as a percentage of the principal. The asset borrowed can be in the form of cash, large assets such as vehicle or building, or just consumer goods. generating process. Arbitrage free term structure models are less theoretical models and are more exercises in data fitting. They are known as arbitrage free because they work under the assumption that the market term structure is correct and that there are no opportunities for arbitrage. While working with sample data, an arbitrage free term structure model can be made to fit the data exactly by using as many constant parameters as data points. In practice, a small number of constant parameters are usually enough to provide a good approximation of the term structure. A subtle and often overlooked property of arbitrage free term structure models is that numerically solving the stochastic process generated by an arbitrage free model will always necessarily yield the term structure as output. Mathematically, it implies that the data fitting exercise behind arbitrage free models is, in some sense, one-to-one mappings. The result, which some consider purely definitional, drastically reduces the time needed to solve the models using numerical optimization techniques. The standard deviation of the short-term interest rate. The term premium of the short-term interest rate.